While I had been meaning to revive this blog – as the rather long hiatus was unplanned – my efforts at actually doing so were rather half-hearted and excuses plenty. A sweet and touching message from Madhu yesterday was the push that I needed. Thank you, Madhu. Considering this is my first post in more than a year, it did take a while to decide what it would be about. As I toyed between a movie review and a song post, what tipped it in the latter’s favour, besides the rather obvious fact that a song post is quicker to finish, was the fairly recent news of the demise of Shakila, one of the sweetest actresses of the 1950s and early 60s. Perky, lively and likeable, I had been fond of her when I used to watch Hindi movies frequently. In a brief career that spanned just over ten years, Shakila (Jan 1 1935- Sep 20 2017) had made her mark as a sweet, fragile looking leading lady who had been cast opposite leading actors of the time such as Guru Dutt, Dev Anand, Raj Kapoor and Sunil Dutt. Unlike the more famous actresses of her time, there isn’t much information available on Shakila. Her wikipedia page also does not give much information about either Shakila the actress or the person. She quit acting on her own volition after her marriage in 1962, bringing to a close a 10 year career; at atime when she was probably at her peak working with actors such as Raj Kapoor (Shriman Satyawadi), Manoj Kumar (Reshmi Roomal, Nakli Nawab) and Pradeep Kumar (Ustadon ke Ustad). Once out of moviedom, Shakila faded away from the limelight, content with her life as she shuttled between London and Bombay. The songs chosen for this list are in no particular order. The list includes both solos and duets and may also be from the same film. These are songs that sprung to my mind when I read about her demise that Wednesday afternoon and are the ones I associate with this sweet, petite looking actress I was fond of back in my childhood days. 1. Hoon abhi main jawan aye dil (Aar Paar, 1954, O.P. Nayyar, Geeta Dutt): Shakila’s debut as leading lady was in the lesser-known 1953 Homi Wadia film Alibaba aur chalis chor. While the movie may not be remembered today, back in those days, it did good business at the box-office and her career took off.It was Shakila’s turn as the side role, the moll in Guru Dutt’s Aar Paar (1954) that catapulted her to the limelight. Ironically, even though the heroine Shyama did have some lovely songs picturised on her (the entire soundtrack is fantastic), the two club classics, filmed on Shakila, Babuji dheere chalna and Hoon abhi main jawan are the ones that are more remembered today. A gorgeous Shakila, drunk, conveys the pathos and futility of time, as she holds on to and looks for the last vestiges. The song is aided by the subdued music and Geeta Dutt’s sultry voice. A classic for all times. Shakila puts in a rather winsome show in this song as she wafts along the room, lip-synching this melodious haunting song. Her wavy hair, aided by those loose sleeves of her nightdress (which I assume to be white), help in creating the atmosphere. After all the song is from the 1962 film Tower House. As the title suggests, the action and the mystery is centred in a tower house, of which this sweet sad lady is an occupant. Despite the melancholic setting and the subdued tune, Aye mere dil-e-nadaan is also a strangely hopeful number, where in the protagonist is coaching herself to brave up to the storms and vagaries of life. In the movie, if I remember correctly, her mother (the lady in the portrait) kills herself (by jumping out of the tower house) and the whole movie is about some secret associated with it. Shakila is sad but not distraught – like a little lost girl trying to find her feet. This is probably the most famous song filmed on her. An antakshari favourite, Aankhon hi aankhon mein ishaara ho gaya stars a debonair Dev Anand along with Shakila. While Waheeda Rehman may have garnered all the popularity in this movie (on account of being Guru Dutt’s protege), it is Shakila who is the leading lady in this Raj Khosla directed crime thriller. This catchy song sung by Rafi (listen to how he sings just the one line so differently each time) and Geeta Dutt captures the breezy effervescence of first love in its entirety. Dev Anand is playful, dashing and Shakila complements him with her subtle seductiveness – expressed mainly through her eyes. Running around trees (literally) has probably never been as charming! I was probably around 12 years old when this Muslim social was aired on Doordarshan. Shakila, if I remember correctly, is the younger sister of K.N. Singh and Ashok Kumar (who are some Nawabs). Our hero Manoj Kumar is, but naturally, a poor shayar with a golden heart who somehow lands up at a mushaira hosted at the Nawabs’ place. He presents his soulful defence of ishq, listing all the pluses of love (which has the heroine swooning). Shakila is suitably mesmerized (though I would think this is more because of Rafi saab’s voice and perfect rendition) as she sits in the zenana quarters and listens to this presentation. Composed by Ravi, Sau baar janam lenge, one of my personal favourite Rafi numbers is a mellifluous song with an other-worldly feel – listen to the lyrics (by Asad Bhopali), the way it has been sung and it’s picturisation. The “dead” lover is singing to a distraught Shakila and is asking her to be hopeful….”Sau Baar Janam Lenge, Sau Baar Fanaa Honge, Aye Jaanewafa phir bhi Hum Tum Na juda honge” There is no one in the vicinity – near the waterfalls or beyond it. Shakila recognises his voice and looks around frantically but fails to spot him. Pradeep Kumar, the hero, makes an appearance right at the end of the song when he comes and gently taps her on her shoulder. The shock on her face is worth noting – the man she considered to be dead is hale and hearty! This was Shakila’s last film as an actress – as she moved to the UK shortly after. 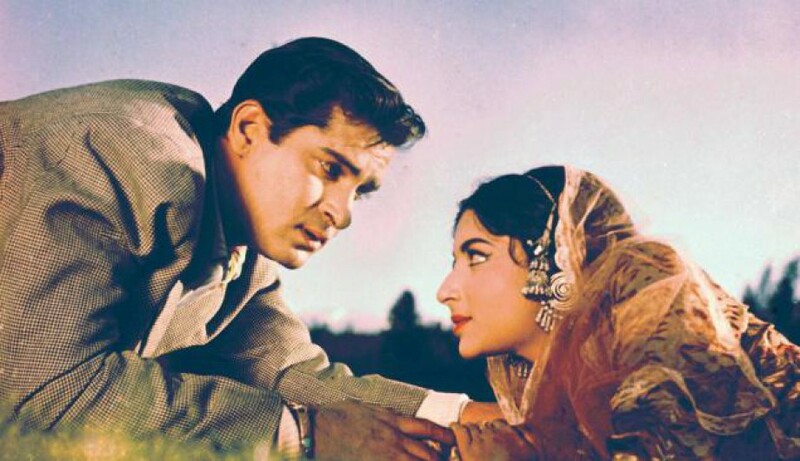 Sunil Dutt and Shakila make a striking pair as they portray two pining, sleepless lovebirds. The song, one of Hemant-Lata’s best duets, is sensuously picturised, conveying the longing and desire of these beautiful people. Well, what can I say about this song? An out and out Shammi/ Rafi classic, where Shammi Kapoor grooves, moves and swings around wooing his pretty ladylove, Shakila gets her part right. The pretty dame is not at all happy and makes her displeasure known. Magical! Couldn’t resist adding yet another song from China Town. This lovely Rafi-Asha duet is one in which Shakila also gets to do some acting. A song that is more Nayyaresque in style, it has a handsome Shammi Kapoor and a gorgeous Shakila traverse through Calcutta, first on a tonga and then on a boat. The handsome couple and the sights of Calcutta make this a pleasing watch. This is a melodious duet from Shakila’s debut film. Surprisingly, she does not come across as raw, rather displays the innate charm and confidence of her later, more successful ventures. While the movie may not be remembered today, this duet is still popular (most old Hindi film music lovers do remember / know this one). Ending the list with the immortal classic for which Shakila will always be remembered. Countless remixes, cover versions later, this song is still memorable – as much for Shakila’s emoting as she warns men of the pitfalls of love and Guru Dutt’s incredulous expressions; as for Geeta Dutt’s rendition and O.P. Nayyar’s excellent music. Shakila ji may have passed on; but in my memories of her as a Hindi film heroine, she will be the sweet lost likeable girl with her trademark wavy/curly hair; an actress I was fond of! This entry was posted in Old Hindi songs and tagged Asha Bhosle, Baar baar dekho, Babuji dheere chalna, Dev Anand, Geeta Dutt, Guru Dutt, Hoon abhi main jawan, Manoj Kumar, Mohd. Rafi, O neend na mujhko aaye, O.P.Nayyar, Pradeep Kumar, Ravi, Sau baar Janam lenge, Shakila, Shammi Kapoor, Sunil Dutt. Bookmark the permalink. Oh, and this one from Agra Road (where her pairing with Vijay Anand was delightful – their romance was this playful, comfortable sort which made you feel that they were as good friends as they were lovers). Welcome back Harini! What an interesting curation of music. I particularly enjoyed Baar Baar Dekho.